Learn how to enable Service Point selection on checkout for your customers. Before you could start using service points, a connection with the module must be made, as described above in the "connecting your online store section". This ensures that all the requirements are met beforehand. After connecting, you can activate Service Points using your integration settings page in the SendCloud Panel. 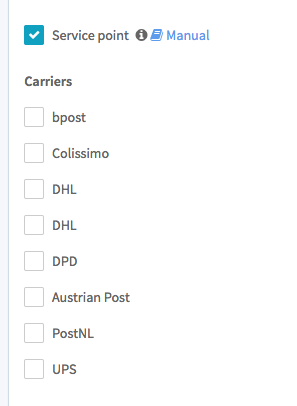 Click on Service point in the integration settings screen and a list of the available carriers will be displayed. Choose the carriers that you would like to enable to your customers to select delivery locations at checkout. Save you new integration settings and you should be able to find our Service Point Delivery carrier in your PrestaShop back office. In order for your customers to select a service point location on the checkout, your PrestaShop must have a Service Point Delivery carrier available that is correctly configured. This carrier is automatically created when enabling Service Points from SendCloud Panel. You must define the shipping zones where the Service Point Delivery carrier is going to be available and also your pricing rules for that. Go to Shipping > SendCloud and click Change carrier details in the Service Point Delivery section. You should see the Carrier management screen of PrestaShop. 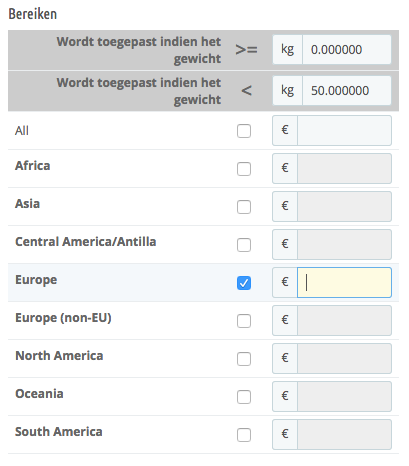 Choose Shipping locations and costs from the main navigation area. You can optionally change the Transit Time field to the expected delivery time description (e.g: 2 business days). You can now choose which customer region to activate Service Points and set your price rules for each of them. In the example above, customers coming from Europe will be able to select Service Point Delivery as a carrier during the checkout. Click the Finish button on the bottom of the carrier setting screen and you are ready. Remember: use Shipping > SendCloud whenever you want to change the carrier available in the Service Point Delivery. After enabling the Service Points your customers will see the Service Point Delivery carrier in the Shipping step during checkout. SendCloud service points are also supported on the native One Page Checkout from PrestaShop. Unfortunately, we do not support third party checkout modules. If you want to use One Page Checkout, please refer to the official PrestaShop documentation and change your Order process type settings.